No man is an island, but you can feel like a lone voice in the wilderness sometimes. As such, it has been reassuring to recently read the Nottingham Food Blog and see that I am not the only person who feels driven to pleading despair by the obsession with pulled pork and the insistence on putting chips in metal buckets that seem to have plagued Nottingham in 2014. The lack of imagination of the former and the sheer naffness of the latter (plus the failure to recognise that a metal tin will conduct heat away from the chips on the outside while the ones on the inside will be forced to hold their steam and thus go squishy) have both evidently raised my blood pressure more than their collective salt and fat content. 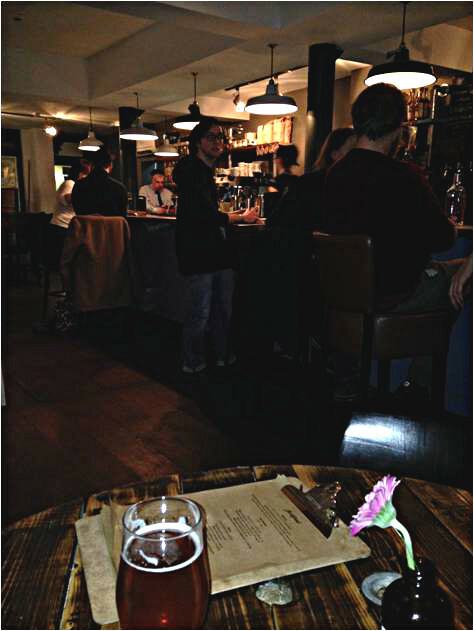 So I went to Junkyard fearful of seeing both, given its general on-trend craft beery-ness. The venue has been well designed to maximise use of the L shaped floor space and is simply furnished, with bare taps protruding from the wall and a blackboard showing the day’s offerings on draft. Beers are served in 2/3 pint measures and the bottles and cans of beers, ales and stouts cover two sides of A4 in designer 10 point sans serif. A selection of interesting cocktails includes a riff on bacon and maple pancakes, whilst the wine list is well balanced if over-priced (all upwards of £4.50 for 175ml of the house wines). Having a range of wines by the glass in a small venue is problematic, especially if most of your punters will be drinking beer, because the wines oxidise quickly and you end up with a lot of bad half bottles to choose from. The Chardonnay I tried first was undrinkable, but a glass would have cost me the price of a decent-ish bottle in the supermarket – something the Junkyard might like to consider. The food menu is relatively concise, only managing to cover a page on the clipboard by adding three brunch items to the top. 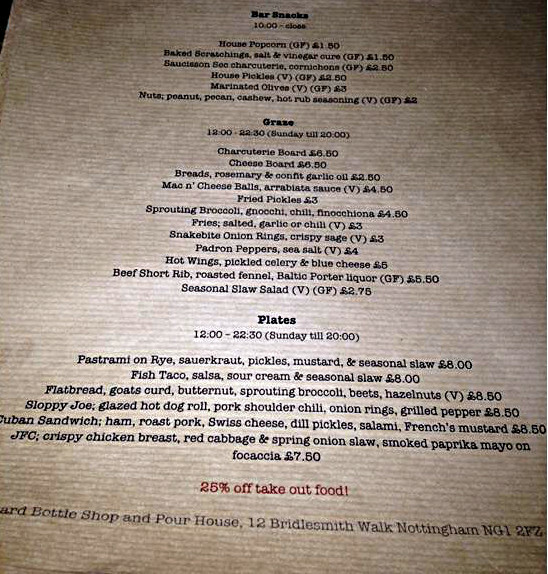 The menu is slightly confusing at first but basically lists items of increasing size from top to bottom: bar snacks, a selection of things categorised under ‘graze’ and finally a selection of sandwiches at the £8 mark. I’m there for dinner, a proper meal, so what should I order? Is this tapas deep fried Americana style? Will a taco at £8 be the size of a basketball? Should we get several grazing things to share / fight over? In the end, all four of us went for ‘plates’ plus a couple of servings of fries (£3, with salted, garlic or chilli options). And sadly, these fries did indeed come in enamel buckets – although these were just order as single items so some leniency seems reasonable. But since the joy at seeing a whole menu with no p—-d p–k had raised me up like Westlife never did, I was feeling doubly lenient in relation to my usual pose of ready admonishment. My degree of joy was matched in the diametrically opposite direction by my husband’s reaction to his main, the flatbread with goat’s curd, vegetables and hazelnuts (£8.50). I mean, there would be no reason for a meat eating burger fan with a large appetite to order this, but he did, and thus only had himself to blame for his intense food envy. In comparison to the other three meals, his was appreciably smaller, a fact reinforced by the unhelpful illusion of serving the flatbread in a metal tray at least twice its size. Despite that, he did enjoy what was there, the broccoli being fresh enough that I could smell it from my own seat several yards away. My own plate was a wooden pallet (spot the Junkyard theme) that was barely big enough to manage the quivering tower of pastrami on rye (£8) perched atop, held together by a metal screw (yes, yes, we get it). Screw removed, it became evident that the side plates and cutlery provided were essential tools for taking the sandwich out of the junkyard and rendering it eatable in some way. The only way in fact proved to be a complete dissection, which satisfyingly revealed some serious slices of densely pepper-crusted salty beef, more Katz’s diner than Sainsbury’ wafer slicer. The meat somewhat lost out to the powerful tastebud assassins of sauerkraut, gherkins and mustard, but in an entirely saltily satisfying way. 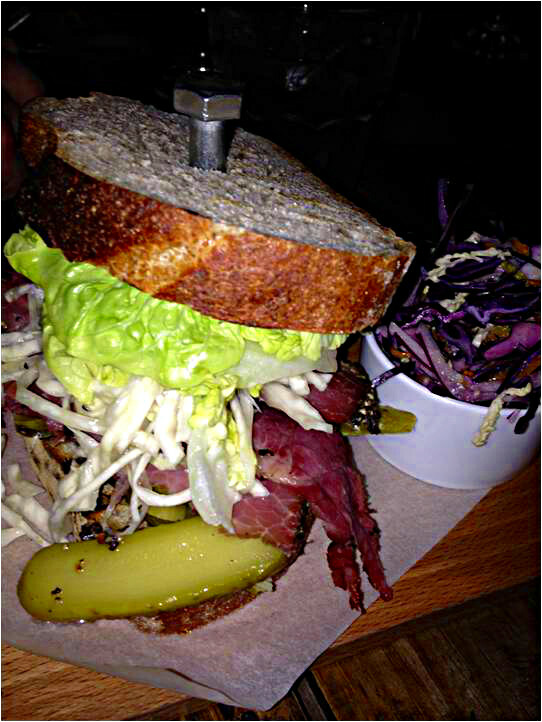 The accompanying slaw was fine but the sandwich would actually be better served by a non-vinegared accompaniment. Our friends enjoyed the JFC (Junkyard Fried Chicken, £7.50, which, once the screw was removed, resembled a coldslaw roadkill event) and the Cuban sandwich (£8.50) and the fried were entirely satisfactory if suspiciously resembling mass produced, throw them in the fryer chips. The staff on the evening were friendly and polite. There are no desserts on offer (some Sahara-dry brownies were perched on the bar counter) but perhaps that’s because no reasonable diner would possibly have room after the main event. While we were there, all the tables and bar perches were occupied, with a good turnover of customers, including a family with kids in single digit ages. With a round and a half of drinks, our bill came to £62, and we tipped out into the night well-fed, happy and pleased to have found such a good spot mere yards from the excellent pizza-fest that is Das Kino – just in case we ever need a back-up plan.